On November 1st-3rd, the Ontario Music Educators Association (OMEA) held its Counterpoint 2018 conference in Hamilton, ON. MAPLE Lab graduate and undergraduate researchers attended and collected data from experienced musicians for our Emotional Piano project. 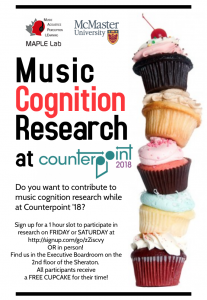 Thank you to all the musicians and educators who participated in this research project at Counterpoint ’18!